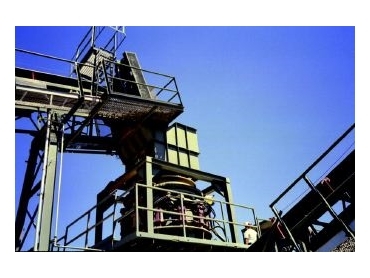 Crushers are designed to take the toughest materials and provide very high cubic throughput. SCHENCK Process Australia , local distributor for Astec Aggregate and Mining Group, now has available the Telsmith Silver Bullet Series (SBS) crushers. Featuring Telsmith's unique percussion crushing action, these heavy duty crushers are designed to take the toughest materials. A combination of high product/high strength crusher allows the user to achieve very high cubic throughput. At the heart of the crusher is the cam and lever action. The cam acts as a wedge between the upper and lower anti-friction thrust bearings, transmitting this powerful force directly to the crushing head. As the cam rotates, the crusher head shaft simultaneously produces a lever action, with radial loads distributed evenly through large bronze sleeves. This combination delivers the most powerful forces to the crushing chamber, to maximise percussion crushing. A common power package in each unit provides hydraulic relief, hydraulic chamber clearing, hydraulic locking and other functions. According to a Telsmith specialist at Schenck, "Telsmith's hydraulic relief and chamber clearing system provides a level of protection against uncrushables and overloads that is unmatched in the industry." The system allows cavity clearing at the touch of a button. Unlike other systems, the Telsmith integral relief valve eliminates the need for accumulators and prevents pressure build up during relief. The crusher never sees more load than the same force generated during tough crushing. The hydraulic locking system produces uniform locking pressure, preventing loss of setting , or bowl "creep", even under the most severe crushing conditions. Locking cylinders are easily accessible from the outside, reacting between the upper frame and the locknut. Full locking pressure is applied at start-up, and automatically maintained during operation. Another unique feature, Dynamic Adjust allows hydraulic motors to provide total setting control under load, through a simple external gear drive. A standard digital setting readout, with 4-20mA output, interfaces with the user's plant automation. Functions such as holding production ratios for specific mix designs, despite gradual liner wear, are done automatically, through this function.